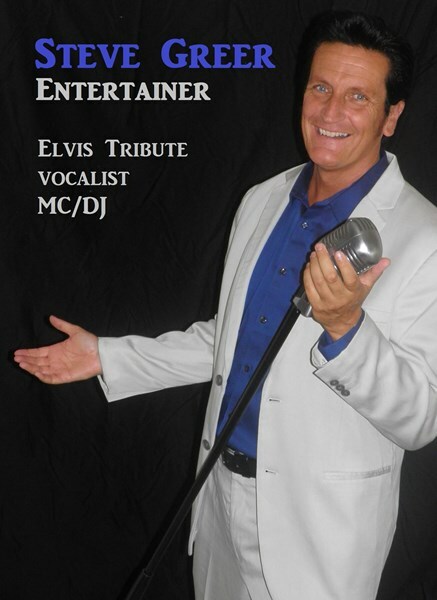 Steve Greer is a singer, DJ and Elvis tribute for all occasions; parties, weddings, corporate and telegrams. Steve is originally from England. THE BRITISH INVASION MUSIC SHOW! Classic British music from the 60's-80's. The Beatles, Stones, Zombies, Herman's Hermits, Searchers, Elton John, Queen, Dire Straits, Wham!, Tears For Fears, David Bowie and much more! All put to a British flag backdrop! Stevie G presents 'The 80's Singer'; classic, cheesy songs from the iconic 80's. Includes songs by David Bowie, Huey Lewis, Culture Club, Soft Cell, Glenn Frey, Frankie Goes to Hollywood, Hall & Oates, Elton John, Spandau Ballet, Lionel Richie, Thompson Twins and Wham! Plus lots more besides!! Ideal for parties and corporate. Backdrops and props available. 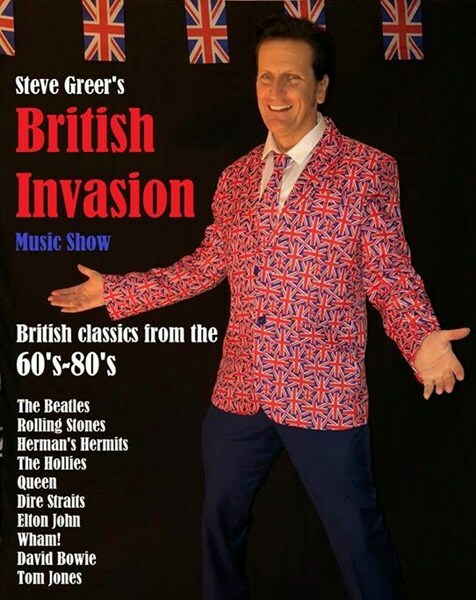 Also available; Stevie G-The 50's & 60's; songs by The Beatles, Buddy Holly, Eddie Cochran, Ricky Nelson, Elvis, Mama's & Papa's, Motown and many more...! Perfect for clubs, bars, over 55's, assisted living, parties. Plus Stevie G - The Crooner; songs by Frank Sinatra, Dean Martin, Andy Williams, Nat King Cole, Louis Armstong, Neil Diamond, Jim Reeves, Barry Manilow and yes...many more! Ideal for assisted living, restaurants, dinner dance, parties. AND!!! Stevie G- Wedding Singer & DJ to bring it all up to date if needed. Steve is the original wedding singer and perfect for your wedding! Steve Greer has over 25 years experience as a singer/entertainer. One of the leading Elvis tribute acts; Steve has performed on cruise ships. over 55's, assisted livings, corporate, weddings, parties and events in the US, Europe and the UK. He now brings to you 3 specialist, dynamic shows that will have you rocking in the aisles! Add an additional female singer for more classic tunes from Madonna, Cindy Lauper, Annie Lennox and more....?? Please note Stevie G - Singer & British Invasion Show will also travel to Winter Park, Lake Jem, Maitland, Goldenrod, Altamonte Springs, Clarcona, Fern Park, Gotha, Casselberry, Ocoee, Windermere, Apopka, Longwood, Winter Springs, Winter Garden, Kissimmee, Oviedo, Oakland, Lake Mary, Plymouth, Chuluota, Killarney, Sanford, Zellwood, Montverde, Lake Monroe, Saint Cloud, Ferndale, Intercession City, Sorrento.